Luke Kelly’s 90th minute penalty gave Dublin City University a 4-3 win over reigning champions IT Carlow on Wednesday, February 1st. Declan Roche’s side took the lead three times in the match but were pegged back by the hosts on each occasion. 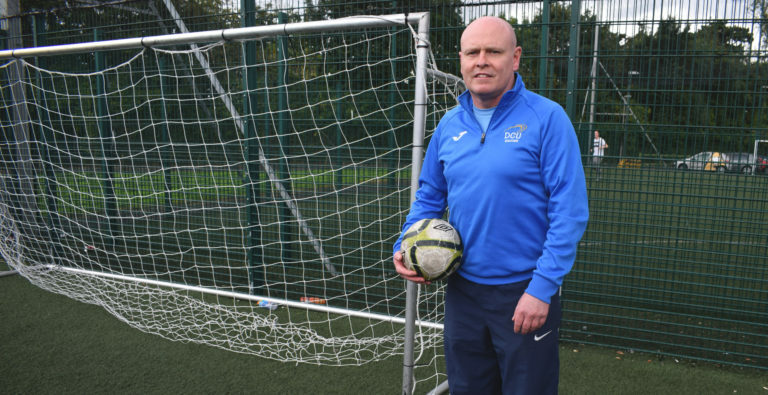 The Ballymun native’s last-gasp winner broke the hosts’ hearts and booked DCU’s place in the semi-final of this year’s CUFL Premier Division. St. Patrick’s Athletic’s Rory Feely played a part in each of DCU’s three goals from play and was the unequivocal man of the match. The visitors took an early lead thanks to some impressive link-up play between Feely and Jack O’Connor. The former played an inch perfect pass from just inside the opposition half. It found the feet of O’Connor behind the Carlow defence and the young striker slotted it past the goalkeeper with little difficulty. Feely played provider for the first goal, but after the champions’ equaliser he grabbed a piece of the glory with a spectacular finish of his own. The Kildare native gave the opposing netminder no chance, curling his 35-yard effort straight into the top corner. The Dubliners couldn’t maintain their lead, though, as Carlow drew level for the second time. While DCU’s second goal was a great individual effort, they showed their quality as a team to put away the third. Eric Whelan split the back four to give the strikers a two-on-one in the box. Alan O’Sullivan drew the goalkeeper out and pulled it back to Jack O’Connor who netted his second of the day. O’Connor then missed the penalty that would have sealed his hat-trick shortly before the home team equalised yet again. It looked like the miss had proven costly for DCU as extra time loomed but the referee awarded another penalty. This time Luke Kelly made no mistake. “There can be no underestimating the achievement of the players to reach the semi-final of the Premier League,” manager Declan Roche said. Despite his elation at his team’s success, Roche insists that the focus now must turn to the semi-final against University College Cork on Wednesday, February 15th. The aforementioned semi-final against UCC will take place in St. Clare’s on Wednesday February 15th with a 2pm kick-off. DCU team: Lee Doyle; Jack Blake, Eric Whelan, Gavan Kearney, Craig Farrelly; Rory Feely, Craig Dowling, Luke Kelly; Jack O’Connor, Alan O’Sullivan, Ross Tanehy.